The hat manufacturing industry, for which Luton became famous, began in the sixteenth century, quickly making Luton the main centre for Bedfordshire and Hertfordshire. The industry dominated the local economy, so much so that during the Great Depression of the 1930s the town’s unemployment was significantly lower than the national average. As production shifted from straw to felt, Luton’s hats were marketed across the globe. Earliest settlements in the Luton area can be traced back over 250,000 years, but the town’s foundation dates to the sixth century as a Saxon outpost on the River Lea, from which Luton derives its name. St Mary’s Church in the heart of the town centre has been rebuilt and refurbished constantly over the centuries and was built in about 930 AD by King Athelstan as an act of thanksgiving for victory over the Danes. 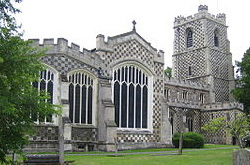 The Church is one of the largest in Bedfordshire and considered a fine example of medieval architecture. 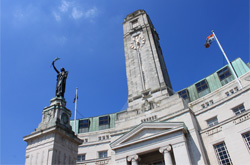 The current Luton Town Hall, at the junction between Manchester Street, Upper George Street and George Street, was completed in 1936 and is situated on the site of the older Town Hall which was burnt down 19 July 1919, following the Peace Day Riots. 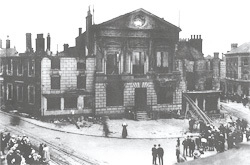 The new town hall is a steel-framed building clad in grey Portland Stone and is built from no fewer than seven million bricks. The building has many typical Art Deco features and many of the interior’s original furnishings survive to this day, including the windows, staircase rails, door panels and radiator screens. Many of the features recall images from the town’s coat of arms, which is displayed above the main entrance: the bee, the wheatsheaf, the rose and the thistle.